For those of you who think Jake and I are that crazy couple that stopped eating grains, sugar, and processed foods (gasp!) years ago, you’re going to think we really fell of our rocker this time. Please allow us to introduce you to our new favorite and deliciously decadent treat, Hot Buttered Coffee. Until today, we’ve been happily drinking our coffee with grass-fed heavy cream, but, based on a recent post Jake discovered by Dave Asprey (aka the Bulletproof Executive), we decided to give his Bulletproof Coffee a try. I was intrigued, but pretty nervous. I am used to salted grass-fed butter on our veggies, and couldn’t get the thought of that taste out of my head. The comments on Dave’s article were so positive, however, that I really wanted to try this for myself. I know that unsalted butter is more of a sweet flavor, but just couldn’t imagine how on earth the taste would blend with coffee. I ended up loving it. Don’t knock it ’till you try it! The recipe is as simple as it sounds. Brew a cup of great-quality coffee. 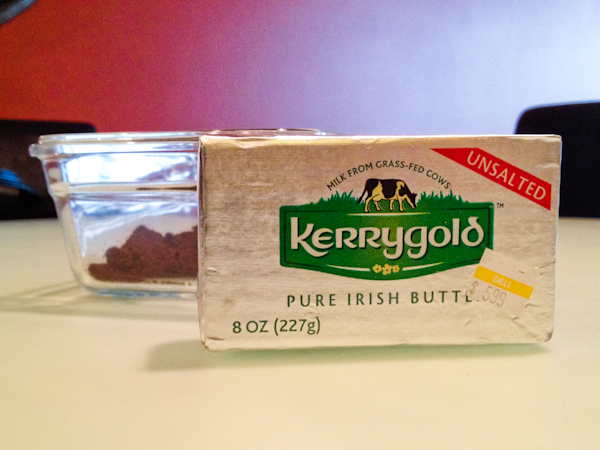 Blend in 1-4 tablespoons of UNSALTED, GRASS-FED butter (such as Kerrygold) based on your taste preferences. 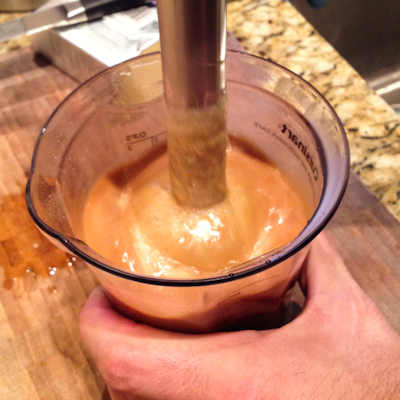 Our butter was hard – just out of the fridge, and we blended it with the hot coffee using a hand blender. 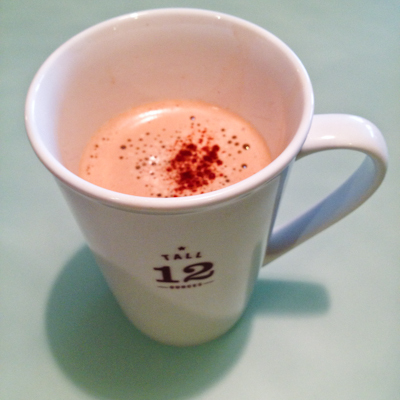 It mixed together quickly and resulted in a very smooth, very velvety coffee. It’s a super luxurious treat for your taste buds! Sprinkle with cinnamon, and enjoy! How do you think ghee would work if you don’t have the butter? Grass-fed, unsalted ghee would be great I think! Let me know if you try it! Sounds yummy – I need to figure out where I can buy Kerrygold. They don’t have it at our natural foods store here…. Trader Joe’s had unsalted Kerry’s in Seattle. I bought some yesterday to try the recipe. Costco has it as well! I really want to try this but I’m having he worst time tracking down unsalted grass-fed butter. Hi Matthew! We get ours from the Issaquah PCC – they carry both the Kerry Gold unsalted and one other brand as well. How’s Studio N treating you? Good call on the Issaquah PCC I forget about them much better parking than WF in Bellevue and we go to the Costco out there too. Tried it this morning. It is absolutely divine. Came to your site 2 check check your Caesar recipe. Love Caesar! Thanks for the “bleep” about the coffee. 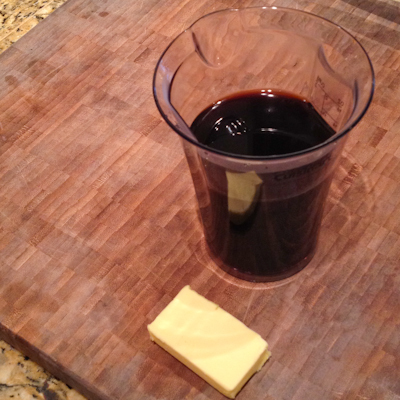 I’ve had butter coffee for a week–can’t wait until morning. Passed it on to my sis. We’re older & going to watch our waist shrink a little! Thanks! Thanks for the “bleep” and the demo about the coffee. Love it–love good food and better health! Make it every day–can’t wait until morning. Passed it on! I tried coffee today with coconut oil in it, just stirred it in my cup, maybe closer to one teaspoon, since this was my first. I had never tried or thought of butter in coffee. Yum! Gives your lips a luscious coating too.